For the third week in a row, demand grew for proof 2013 Girl Scouts of the USA Centennial Silver Dollars, U.S. Mint sales stats show. In the latest report below, the proof commemoratives advanced another 2,988 after climbing 1,406 and 558 previously. They were the ninth best-selling numismatic product for the United States Mint. With the latest orders on the record, a total of 77,838 of the individual coins have sold. 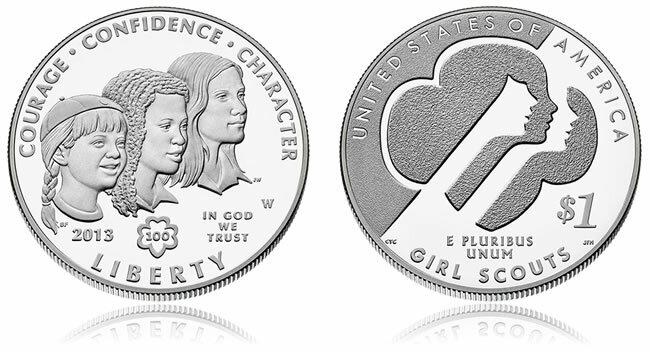 The uncirculated Girl Scout Silver Dollars inched up by comparison, rising 282 to a total of 28,976. Cumulative proof and uncirculated purchases now reach 106,814. Proof Girl Scouts Silver Dollars were not, however, the most popular silver products for the U.S. Mint. Two others pulled in more orders. The 2013-W Proof American Silver Eagle climbed 6,042 and moved its new total up to 568,155 and the 2013 Silver Proof Set followed close behind with 5,665 new purchases. So far, collectors have picked up 244,812 of the sets since their release on May 2. On the bullion front, the bullion American Silver Eagles are still hot, hot, hot. Ten more days remain in the month, and already the U.S. Mint’s network of Authorized Purchasers have taken 2,368,000 coins. For the year, they have purchased 24,136,500. As a comparison, at this time last year the annual total had reached 16,234,000. Sunday, June 16, 2013 is the as of date for sales of the United States Mint numismatic silver coins above. Thursday, June 20, is the as of date for the above bullion silver coins. All 2011-dated and 2012-dated America the Beautiful Bullion Silver Coins sold out on March 1, 2013. The United States Mint released the bullion 2013 White Mountain coin on May 13, 2013 and bullion 2013 Perry’s Victory silver coin on June 3.